This year Roxy Therapy Dogs will celebrate #GivingTuesday on November 27th with its Making Special Connections campaign. 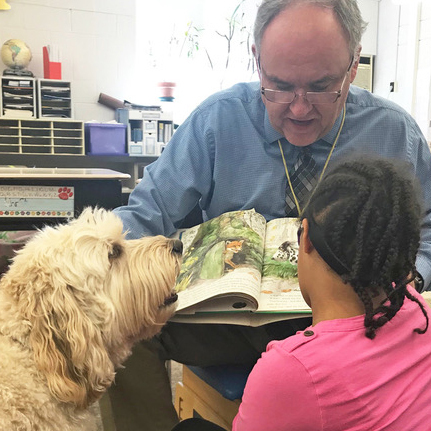 Roxy therapy dogs make special connections with children in the Central Bucks School District every day through many of its programs, especially the Student Specialized Support program. Donations provide the opportunity for Roxy Therapy Dogs to recruit more certified pet therapy teams to fulfill the demand for visits. Approximately 30% of the classrooms Roxy therapy teams visit are specialized classes including children with multiple disabilities, autistic support, learning support, life skills and emotional support. The program started several years ago in the elementary schools and has grown to include the high schools. Students quickly become comfortable interacting with dogs and are often better able and willing to communicate their thoughts and feelings to teachers and parents after a visit. Many teachers and therapy dog teams have first-hand experience of the difference therapy dogs make for students in non-mainstream classes. Roxy dog, Finn, is helping his friend to read. “Roxy Therapy Dogs is really excited to be participating in the #GivingTuesday initiative for the second year. This year, we are shining the spotlight on our Student Specialized Support program, serving the specific population of students who are in specialized classes. As the number of these classes in the Central Bucks School District increases, so does our need for uniquely qualified, certified therapy dog teams to support these classrooms,” said Sharon Fleck, president of Roxy Therapy Dogs. Studies show that exposing students in non-mainstream classes to dogs benefits the students developmentally, cognitively, socially and behaviorally. Many of the teachers and dog therapy teams have experienced positive results first hand. Continuity with the visiting dog therapy teams is also important in the educational and developmental needs of the students. Donations will support visits with the therapy dog teams year-round as Roxy participates in the Central Bucks School District Extended School Year program. #GivingTuesday is a global day of giving that harnesses the collective power of individuals, communities and organizations to encourage philanthropy and to celebrate generosity worldwide. Following Thanksgiving and the widely recognized shopping events Black Friday and Cyber Monday, #GivingTuesday, founded in 2012, inspires people to collaborate, give back and support the causes they believe in. Over $300 million was raised online to benefit a tremendously broad range of organizations, and much more was given in volunteer hours, donations of food and clothing, and acts of kindness.